In mid May each year, the jet stream moves north causing the winds the calm and temperatures to warm enough for people to try to summit. This is called the 'summit window'. There is a similar period each fall in November. It can also be very hot with temperatures over 100F in the Western Cwm, an area climbers go through to reach the summit. You have to be 16 or older to climb from the Nepal side and between 18 and 60 on the Chinese side. The average expedition takes about 39 days. Usually their first name is the day of the week they were born. 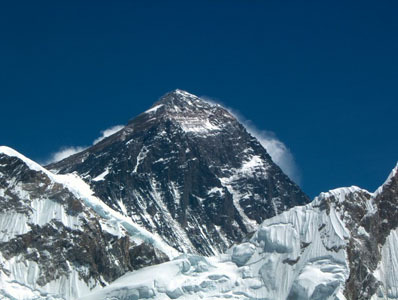 Sherpas feel it is disrespectful to stand literally on the tippy top since that is where Miyolangsangma, the Tibetan Goddess of Mountains, lives.